Two years after it was launched, an LA Unified program aimed at making schools safer for students who identify as lesbian, gay, bisexual, transgender, queer or questioning (LGBTQ) is being praised as it expands to eight other major districts around the country. The “OUT for Safe Schools” program was created in 2013 by a school board resolution authored by board member Mónica García and calls on district staff and teachers to wear rainbow-colored badges on Oct. 11, which is National Coming Out Day. The badges identify them as an ally of LGBTQ students. The program, with the aid of the Los Angeles LGBT Center, has seen around 30,000 LA Unified staff participate in each of the last two years. This year, districts in New York, Chicago, Boston, San Francisco, San Diego, Duval County (Florida), Oakland and Washington, D.C. are adopting the program. An LGBT Center release pointed to a 2014 study by the Gay, Lesbian & Straight Education Network (GLSEN) which found that 65 percent of LGBTQ students heard homophobic remarks frequently or often, 56 percent reported personally experiencing LGBTQ-related discriminatory policies or practices at school and 33 percent of LGBTQ students were physically harassed in the past year because of their sexual orientation. 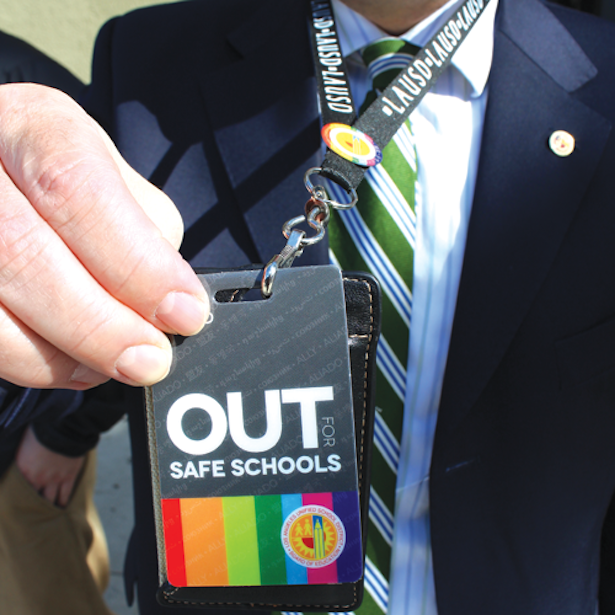 The badges aren’t just symbolic, as they indicate the wearer can be approached if an LGBT youth needs help to feel safe at school, according to the LGBT Center. Staff at the participating districts will also be trained by Gay-Straight Alliance Network staff, to improve the campus climate for LGBTQ students with funding that comes from a grant.